Can Ryan’s Stock JL Keep Up With his Modded TJ Offroad? Comments Off on Can Ryan’s Stock JL Keep Up With his Modded TJ Offroad? 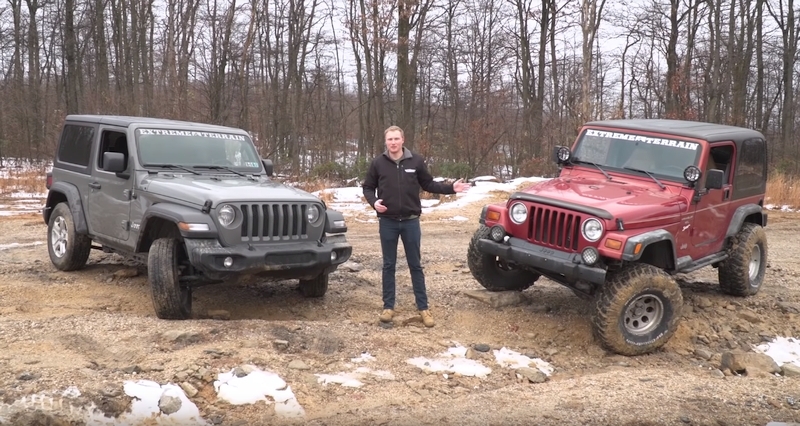 PAOLI, Pa. (February 6th, 2019) – In the latest edition of ExtremeTerrain’s (XT) “Throttle Out” YouTube Series, XT host Ryan Huck visits Rausch Creek Off-Road Park in Pine Grove, PA with his new, stock, 2.0L-powered 2018 JL Wrangler 2-door and his trusty, heavily-modified, 1998 TJ Wrangler to give them a proper shake down while comparing how each performs on the trail. Ryan has had his TJ since he earned his license over 16 years ago and it was his daily driver until recently, when he purchased his new JL. His TJ has been through several iterations of lift kits and is functionally modified with all the supporting components needed to handle even the toughest of trails. On the other hand, his new JL Wrangler is bone-stock, for the time being, but is equipped with more technology and modern architecture, making for an interesting comparison to his old TJ on the trail. Which one would you choose to take out on your local trail? PAOLI, Pa. (Jan 15th, 2019) – In this episode of ExtremeTerrain’s Throttle Out YouTube Series, Ryan Huck takes a 2018 JLU to Rausch Creek Off-Road Park in Pine Grove, PA to test the JL Hill Descent Control (HDC). This new feature, available in the JL Wrangler, is only intended for low speed off-road driving. When HDC is activated in 4-low, it automatically applies the brakes while descending hills at speeds below 30 MPH.While using this feature, the driver has control over the exact speed the vehicle will descend — even over bumps, stair steps, and jagged rocks.In addition to his explanation, Ryan walks through, step-by-step, how to activate HDC as well as demonstrating the feature’s capabilities in real-life situations on the trail. Using two different areas of the park for his demonstrations, Ryan tests how well the HDC can handle a variety of trails and surfaces. PAOLI, Pa. (DEC 27th, 2018) – ExtremeTerrain’s (XT) Ryan Huck orchestrated a camera crew and two bone-stock JL Wranglers during a trip to Rausch Creek Off-road park to create this Throttle Out episode comparing the new 2.0L Turbo 4-cylinder Wrangler against a 3.6L V6 JL. The purpose of their mission was to take both JL’s on the trail to see if one engine performed better than the other off-road. In this video, Ryan demonstrates the off-road prowess of both configurations, while hitting a few different types of obstacles to show how each performs at different RPM’s. As a seasoned, technical wheeler, Ryan fights off his natural instincts, putting the throttle down on both JL’s, to provide evidence for his comparison. Even with the difference in power output and power band, both configurations were more than capable of handling the snow-covered trail and were evenly matched in their native off-road environments. 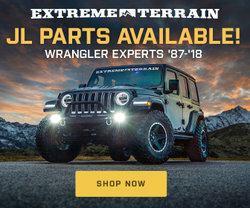 PAOLI, Pa. (December 19th, 2018) – ExtremeTerrain’s Ryan Huck has produced the video, “How Jeep Suspension Works | Jeep Suspension Geometry Explained”, as an informational tool for the 4×4 community focusing on modified Wranglers. A variety of Jeep lift kits are available for the Wrangler so understanding the components that can improve suspension geometry, handling, and ride quality will, inevitably, make for a well-informed offroader. In this video, Ryan discusses everything from control arms to trackbars, drag links to caster and pinion angles, while explaining their significance in a Jeep with increased ride height. 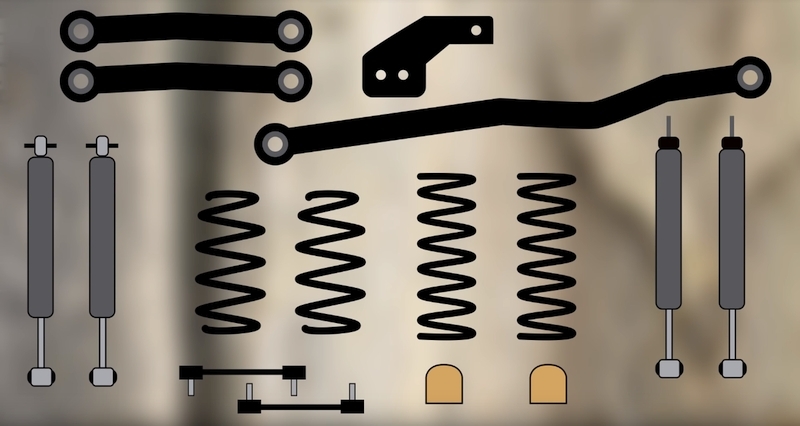 With the assistance of animations and a magnetic angle finder, Ryan extrapolates on suspension geometry, providing his expert voice on a very popular Jeep topic. PAOLI, Pa. (December 11th, 2018) – ExtremeTerrain’s Ryan Huck created a demonstration to show the effects of death wobble on JK Wrangler with a 3.5” Rock Krawler Lift Kit and 35” tires. Equipped with his sophisticated measuring device, aka the Rynograph Wobbleometer™, Ryan runs through a series of tests to show what death wobble is, what you can do when experiencing the sensation, as well as the fix(es) to prevent it from occurring again. From bushings to trackbars, Ryan runs through all the scenarios where death wobble can occur on a Wrangler, so you can stay safe on and off the road! © 2019 AZoffroading.com - Arizona off-roaders' website. All Rights Reserved.